The Times has here “revealed” the the existence of a group that publicises itself via its own website, and which was subjected to effective critical scrutiny by Brian Whitaker on Medium in February. The group is certainly of journalistic interest, but the decision to make it the lead item seems to me to be to be overkill, and to describe the “four professors” as “top academics” is sensationalising. Given that the article was published on Friday night, just as western airstrikes on Syria were about to get underway, one has to suspect that the intention was not so much to “reveal” the group as to set up a contrast between support for the strikes and dubious and invalid reasons for opposing (or being wary of) them. 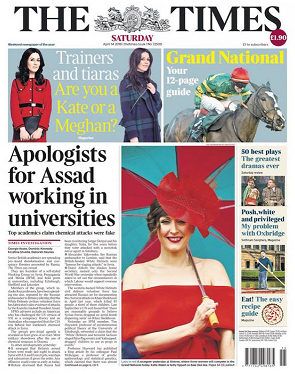 Thus a follow-up item was headlined “Academics accused of speaking for Assad condemn Syria raids”, and consisted mainly of Tweets and blog posts by members of the group. The academics highlighted by the Times coverage are Dr Tara McCormack, a lecturer in international relations at Leicester University; Piers Robinson, professor of politics, society and political journalism at Sheffield University; Paul McKeigue, a professor of genetic epidemiology and statistical genetics at Edinburgh University; and Tim Hayward, professor of environmental political theory and also at Edinburgh University. The quotes provided in both Times articles (and a third) are not to their authors’ credit: Hayward has promoted a claim by Vanessa Beeley that the White Helmets had kidnapped and drugged children in order to fabricate the earlier gas attack on eastern Ghouta, while McCormack described the White Helmets as “basically Al [Qaeda]”. However, the print edition of the newspaper apparently contained one quote from another member, Louis Allday, that Allday has credibly shown to have been a misattribution. Professor Hayward has written for the alternative news website 21st Century Wire, whose associate editor is Vanessa Beeley, daughter of the late British diplomat Sir Harold Beeley. She claims that the White Helmets are al-Qaeda-affiliated and, as “terrorists”, are a “legit target” for Assad’s forces. Beeley, as I’ve noted previously, has attacked the White Helmets in the US on Infowars and in the UK on Brian Gerrish’s UK Column and the David Icke-affiliated Richie Allen Show. The SPM’s advisory board includes “Mark Crispin Miller, who was said to have called the US government’s account of the 9/11 attacks a ‘conspiracy theory'”, and “David Blackall, an Australian academic who tweeted ‘CIA stages gas attack pretext for Syria escalation’ with a link to a blog article”. Last November the group set up a non-profit company called Organisation for Propaganda Studies (OPS)… The group also operates a website – propagandastudies.ac.uk – which is registered in the name of Sheffield University and is hosted on the university’s servers. 1. According to The Times, the hashtag “went viral after being used by alt-right figures in the US, including Mike Cernovich, a main proponent of the ‘Pizzagate’ conspiracy theory… [and] was said to have been promoted by a Russian cyberoperation”. This seems to me to be stretching a point – most people use hashtags without delving into their origins. More on Cernovich and Pizzagate here. Of course its fake they want to kick off their pre planned WW3 and you have to be blind not to see it. While you say “it is unlikely that any evidence of Assad’s culpability for gas attacks would be sufficient.” there is a very good point here: not one piece of evidence has been provided that Assad is responsible. Moreover the credible journalist Robert Fisk has actually visited the site and reported statements said to him by a number of doctors: that they did not believe a chemical attack had taken place and the injuries were the result of something else. This does not support a hoax claim but until we have definitive proof it cannot be concluded the Assad regime is responsible when there are other actors who would benefit from the US attacking Assad after a chemical weapon attack..